CICM x JELLYBEAN The College of Intensive Care Medicine of Australia and New Zealand has an Annual Scientific Meeting every year. In 2017 the title was “A Gut Reaction; ICU Gastroenterology from beginning to end.” The organising committee have embraced #FOAMed. The best lectures will be made available for FREE on the Intensive Care Network and on the CICM-ASM site. They invited Doug Lynch to come along and have a Jellybean style chat with the international speakers and Mr President Himself; it’s Charlie Corke. President of the College of Intensive Care Medicine of Australia and New Zealand (CICM). The organisers of the ASM invited #FOAMed podcaster/interviewer Dr Doug Lynch to come along to engage some of the leading lights of the meeting in conversation and record them. These recordings are the latest in a series of podcasts/blogcasts playfully called “Jellybeans”. They are entirely spontaneous chats with interesting people; short, completely unscripted, 100% unedited and recorded in one take. It is essentially a live recording. The focus is unapologetically on the quality of the conversation rather than the quality of the audio recording. The host of the interview is a fast talking Irish doctor, a jack of all trades but a master of none, a perpetual student and a trainee of the CICM. 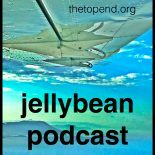 The “Jellybean” is an itinerant podcast that regularly appears on LITFL, ICN and many other websites. Over 100 conversations have been recorded with persons of interest. They will appear on iTunes and Google play once the 100th episode is published later this year. We hope you enjoy finding out a little more about the people behind the CICM Annual Scientific Meeting. The four CICM x Jellybean co-branded recordings are part of a larger collection. It is only these four that are formally associated with the College. This entry was posted on September 19, 2017 by Dr Doug Lynch @TheTopEnd in Uncategorized.